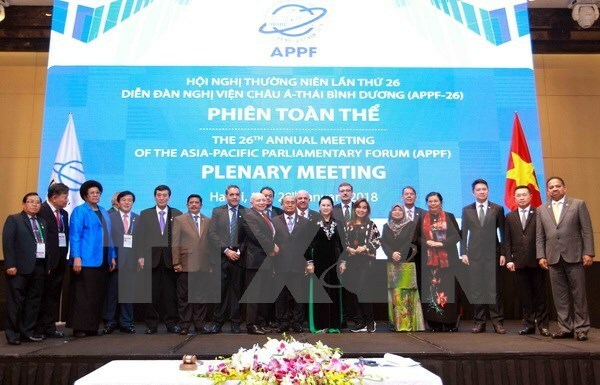 Hanoi (VNA) – The 26th Annual Meeting of the Asia-Pacific Parliamentary Forum (APPF-26), which took place in Hanoi from January 18 to 21, was declared a success with its agenda fulfilled and the Vietnamese National Assembly’s dynamism on display. APPF-26 was attended by 354 delegates from 20 countries and one observer nation. They included seven speakers and 10 vice speakers of parliaments, representatives of the Legislative Council of Brunei – an APPF observer, President of the Inter-Parliamentary Union (IPU) Gabriela Cuevas Barron, IPU Secretary-General Martin Chungong and Vice President Mohammed Ouzzine of the House of Representatives of Morocco – guest of host Vietnam. Themed “Parliamentary partnership for peace, innovation and sustainable development”, APPF-26 featured the second APPF Meeting of Women Parliamentarians and four plenary sessions on politics-security, economy-trade, regional cooperation in Asia-Pacific and the future of APPF. 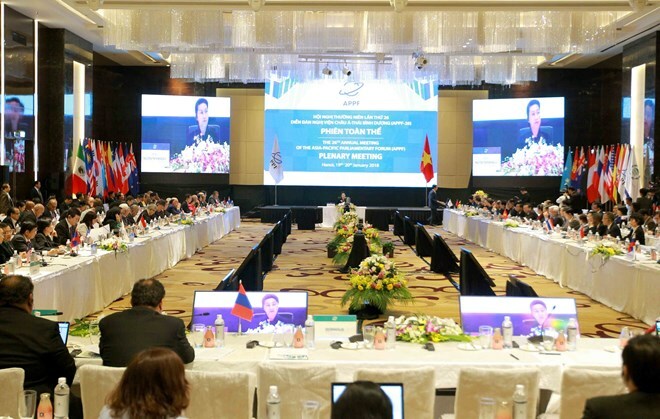 At the meeting of women parliamentarians, Chairwoman of Vietnam’s National Assembly (NA) Nguyen Thi Kim Ngan stressed the importance of the meeting, which she said was an important network to connect women parliamentarians to discuss gender equality and other issues of shared concern. Other participants emphasised that parliamentarians need to bring into play their role in making policies, at the global, regional or national levels, in many fields to promote the realisation of Goal 5 on gender equality among the 17 Sustainable Development Goals. At the first plenary session on politics and security, delegates agreed that Asia-Pacific and the world are trending towards peace, cooperation and development. However, the region also faces risks of conflicts, security threats and other issues like climate change, epidemics and terrorism. Participants condemned terrorism and called for tackling terrorism and trans-national crime through international efforts by enhancing cooperation among governments and agencies in sharing intelligence and improving law enforcement forces’ capacity. At the plenum on economic and trade issues, Vietnamese Deputy Prime Minister Vuong Dinh Hue pointed out the bright spots in economic cooperation and integration in the region. Other participants said despite many difficulties, the Asia-Pacific region continued to have most dynamic development with high growth and economic connectivity. Speakers at the event said APPF needs to bolster cooperation to step up free and open trade and investment towards a free trade region, build a comprehensively interconnected Asia-Pacific and boost the development of high-quality and resilient infrastructure. They emphasised measures to improve the competitiveness and creativity of micro-, small-, and medium-sized enterprises (MSMEs), create favourable conditions for MSMEs to improve their financial and technological access and management capacity and promote policies and legal frameworks for female-led start-ups and MSMEs. They also underscored the need for stronger cooperation in sustainable management and effective use of natural resources, including cross-border water resources, land, forests and seas, thereby helping create sustainable food sources. It is also necessary to step up sustainable rural and urban development, build disaster resilient communities, diversify the agricultural sector and increase investment to raise agricultural productivity and quality. At the plenary session on regional cooperation, participants voiced concern about climate change and extreme weather phenomena, calling for more cooperation to cope with climate change and reduce disaster risks. They also proposed cooperation in culture and tourism be intensified. They stressed the APPF’s role in promoting the partnership for sustainable development and inclusive growth in Asia-Pacific as APPF parliamentarians represent the interests of people in the region. At the last plenum, regional legislators adopted the Hanoi Declaration, new operation regulations of APPF and 14 resolutions. The Hanoi Declaration “A New Vision for Asia-Pacific Parliamentary Partnership” reviews achievements and sets a new vision for APPF after 25 years of development. It highlights plans for regional parliamentary ties and affirms that peace, stability and security are prerequisites for sustainable development. This event showed the world Vietnam’s dynamic and active parliament, an integrated and developing country, friendly Vietnamese people and an advanced culture deeply imbued with national identities. It took place after Vietnam hosted the Asia-Pacific Economic Cooperation (APEC) Year 2017 with the peak being the APEC Economic Leaders’ Week in Da Nang city last November. APPF-26 was a practical action by member parliaments in supporting the Da Nang Declaration “Creating New Dynamism, Fostering a Shared Future”, adopted at the APEC Economic Leaders’ Meeting in Da Nang. It also aimed to promote parliaments’ role in APEC cooperation and bring into play the outcomes of the APEC Economic Leaders’ Week in the parliamentary channel. Talking about the relationship between APEC and APPF, Canadian Senator Yuen Paul Woo said to boost connectivity between the two forums, there is a need to develop a secretariat mechanism and each nation ought to put into actions agendas adopted at these forums. He said countries should learn from Vietnam’s example of closely organising the two events so that relevant points could be integrated together. Participants in APPF-26 also appreciated the thorough preparations of the Vietnamese NA, especially NA Chairwoman Nguyen Thi Kim Ngan who chaired the 26th annual meeting. At a press conference on January 20, Takuji Yanagimoto, Head of Japanese Delegation to APPF-26 and Representative Honorary President of APPF, said thanks to the strong leadership of Vietnam’s National Assembly and Government and all involved parties, the APPF-26 was a great success. APPF-26 was held amid the 25th anniversary of the forum, a new milestone in APPF’s history requiring agenda reforms and new visions for APPF. Yanagimoto lauded Vietnam’s role in the successful APPF-26 and thanked the country for its close coordination in celebrations of the 25th anniversary. He added he was impressed with Vietnam’s development after 13 years since he attended APPF-13 hosted by the country in 2005. He attributed the achievement to enormous efforts by the Government, NA and people of Vietnam. IPU President Gabriela Cuevas Barron applauded Vietnam’s efforts in hosting APPF-26 and expressed her hope that the country will hold many IPU activities in the future. She added Vietnam is a leading country in economic growth and inclusive development, and it also has strong voice on free trade issues. The country also impressed member parliaments with its successful hosting of the 132nd IPU Assembly in March 2015. 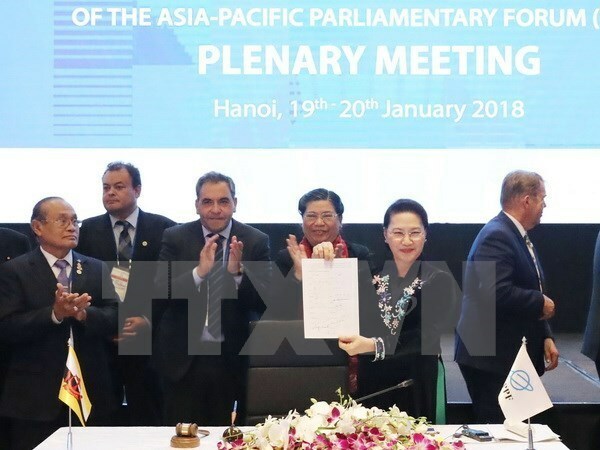 Meanwhile, former IPU President Saber Chowdhury said Vietnam was the perfect venue for member parliaments to discuss the theme “Parliamentary partnership for peace, innovation and sustainable development” as the Vietnamese NA has effectively brought into play the role of representation and supervision.